The Image Resizer has now lots of new features apart from resizing selected images. Now the new Image Resizer can be used to scan images from a scanner, convert images to greyscale, rotate the image or converted images to right or to left. As with initial version, this new interface of the Image Resizer has a single screen interface and can be minimized to system tray. As before multiple image files can be dropped onto the interface to for image conversion and resizing. Given below is the screenshot of the Image Resizer Utility. In order to download free trial of the software please do visit the Image Resizer page, download the software and resize images quickly and easily. Select Single File for Resizing using the Browse for File Dialog. 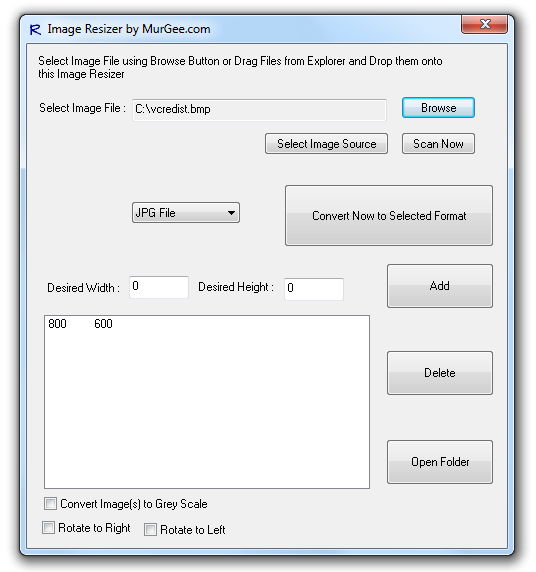 Drag Drop Multiple Image files to the Image Resizer to resize multiple image files. Scan Image from Scanner and convert or resize the selected image. Scanner Selection options to select the Image or Photo Input Electronic device such as Scanner, Webcam, Camera or any other Photo Capturing Device. Convert & Resize Images to Grey Scale. Rotate selected image(s) to right or to left using options provided in the main interface of Image Resizer. Image Resizer works with Windows 8 32 bit and 64 bit versions. The Image Resizer has been tested with Windows 7′s 32 and 64 bit versions. Yes the Image Resizer works on Windows Vista, and Windows XP as well. The Image Resizer is totally free to download & try.